HoogTij is a new development in the northern part of the port of Amsterdam. It is strategically situated along the North Sea Canal, offering excellent access on water and land. HoogTij is only 15 minutes away from Amsterdam Airport Schiphol and located in the centre of the dynamic Amsterdam Metropolitan Area, where businesses have flourished for centuries. HoogTij offers flexible layouts, space for different types of company, and even the opportunity to buy the land. HoogTij is located along the North Sea Canal, on the south-western side of the Municipality of Zaanstad. 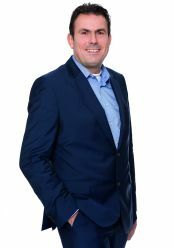 As Amsterdam Seaport and Amsterdam Airport Schiphol are in such close proximity, companies located at HoogTij will form part of one of the five strongest economic regions in Europe. If you decide to base your business at HoogTij, you will benefit from a metropolitan area with a strong economy and educated people who are internationally orientated. Locating your business at HoogTij is good value for money. The land price is very favourable in comparison to other sites in the Amsterdam area. Park management makes HoogTij even more attractive. 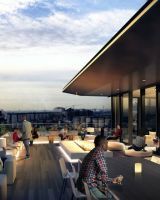 Collective contracts with suppliers offer many financial benefits and help to maintain the site’s premium image. HoogTij (high tide) is a prime new business location in the port of Amsterdam area. It offers plots with flexible layout availability and space for different types of businesses. These vary from 1,000 m2 up to 30 hectares, all with high environmental categories (3.1 – 5.1). Port of Amsterdam invests in a deep sea quay of 900 metres along the North Sea Canal. HoogTij is located along deep sea waters. This is an ideal location for distribution companies, logistics service providers who need a deep sea facility. Container terminal CTVrede Steinweg and logistics services provider Gam BAKKER will establish their business on Hoogtij in 2018. HoogTij is also the business park of choice for companies such as Kuehne & Nagel (logistics), Zuiver (interior design), Wilo (high-tech pump systems) and Groenhart Group (construction materials & equipment). The port of Amsterdam is one of the world’s key logistics hubs. A gateway to all major European markets and all benefits the Amsterdam Metropolitan Area has to offer. But also the port itself offers great oppurtunities such as deap sea, barge, rail terminals and connectivity. Many different companies are located in the port. From fashion and design to heavy industry. All against favourable rates and in a lucrative environment. The flexibility in plot sizes and lay outs, building design and execution, permitted business activities and Port of Amsterdam’s supporting services, offers a the atmosphere to create new possibilities. The port of Amsterdam is already the location of choice for companies such as Calvin Klein, DSV, GE Aviation, G-Star RAW, Hitachi, Renault Trucks, Rivièra Maison, Royal van Lent Feadship, Starbucks, Tommy Hilfiger and many more. From lumber harbors to creative hub, Stadhaven Minerva has transformed into a vibrant creative hive of fashion, design, media, food, and thriving start-ups. Embracing the rugged industrial character, the area renewed itself into a richly patterned business estate for creative entrepreneurs, culture and events. It’s buzzing with creativity and new fashion, media and design business. Stadhaven Minerva is highly accessible and conveniently located close to Amsterdam’s vibrant city center and Europe’s preferred Airport Schiphol. Port of Amsterdam is responsible for Stadhaven Minerva’s park management and strives to achieve a high-quality environment for both real estate and public areas. The focus lies on architecture (including heights, façades, materials, safety) and spatial quality. The area’s unique feature is, without a doubt, the impressive waterfront with views on water and shipping traffic. This inspiring port area offers multitenant buildings with space for large and small scale companies. Embracing its creative signature, companies can co-create their buildings and plots, or participate in a project managed by real estate developers. The Atlaspark industrial estate is the logistics hotspot of the port of Amsterdam, and combines air and sea transport. 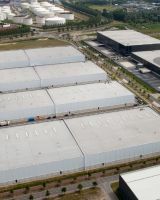 In the Netherlands, it is seen as a model example of how an industrial estate can be designed to meet the requirements of modern-day logistics services. 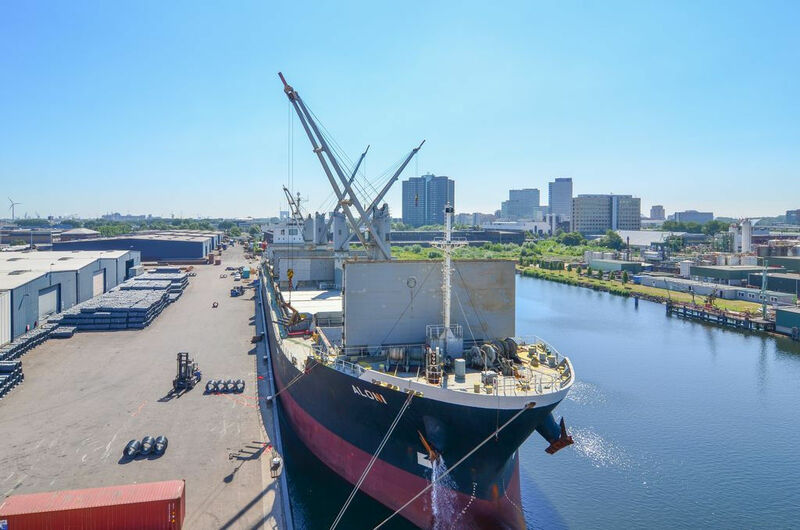 The location offers a direct connection to a wide variety of intermodal transport options by rail, sea, inland waterway, road and air. It is the only industrial estate to offer a multimodal location at this level and on this scale in the Amsterdam Metropolitan Area.